Hong Kong, December 25, 1941, December 24th. in Canada. The guns of war were silent. After a valiant effort the defenders were defeated and face to face with a dark and uncertain future. To make the bitter pill of defeat all the harder to swallow it was Christmas Day. Since the initial attack on the British Island Colony of Hong Kong on December 8th. the Japanese had expected a quick victory and were stunned that the vastly outnumbered British, Indian and Canadian had held them off for 17 days. My Dad, Major Maurice Parker, CO of "D" Company, the Royal Rifles of Canada, was among those captured that fateful Christmas Day that marked the end of the Battle of Hong Kong. His Company was the last to lay down their arm some 4 hours after the official surrender. "D" Company had been ordered to make a last effort to keep the Japanese from taking Stanley Village where the remains of the Garrison had set up defenses for a last stand. Dad, in spite of the fact that the attack ended with "D" Company taking terrible casualties, considered that final effort "D" Companies "finest hour." "The records show that the Company lost 16 killed and 78 wounded in this attack. I gathered up all the men I could find and regrouped, then with 44 sound men, and the walking wounded, we made our way back to Stanley Barracks. After the surrender, I went forward with a working party and buried our dead. The Japs had built a pier and were cremating theirs. There seemed to be many of them. This was Christmas Day." The news of the fall of Hong Kong, and the capture of the Garrison, had brought shaky attempts to enjoy Christmas to an end. The usual joys of Christmas were buried under a mountain of anxiety and fear. The fate of my Dad, and all those we knew, was unknown. It must have been the same across Canada from which had gone a loved one to re-enforce Hong Kong in the faint hope that the addition of troops would persuade the Japanese not to attack. That faint hope had disappeared like a wisp of jasmine blown away by the first Japanese bombs to fall on December 8th., just a few short weeks after the Canadian troops arrived. As night fell on Hong Kong 290 Canadians lay dead, 493 were wounded. Of the 1975 Canadian troops, 40% were either dead, or wounded. Back in Canada families didn't know if their loved one, or loved ones, were alive or dead. Families across Canada feared the worst, and prayed for the best. As time went by, and news came in, many a family found out that God's answer to their prayers was, "Sorry." It is the in the human sprit to make the best of a bad situation. It is true that time heals most wounds and familiarity allays most fears, and routine makes the unendurable o little less so. 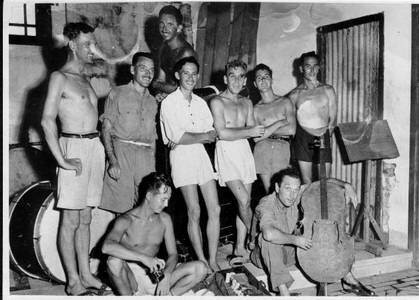 As Christmas 1942 approached the prisoners of the Japanese determined to make the season as merry as possible. Carols were rehearsed to be sung on Christmas Eve. Skits were written and "actors" learned their lines. Instruments had been obtained and the musicians among the prisoners formed a band. A cello made from tin cans had been made for my Dad by Cpt. Stewart Hendersen, Rfm. Wilber Lester and a soldier named Ampi. Dad no doubt brought the audience to their feet with his performance. As much food as could be saved was set aside in the weeks prior to Christmas for a special Christmas Day dinner which followed church services. The services were well attended and prayers wee said for the living and the dead. Prayers were also sent aloft asking that the war be over before next Christmas. The prisoners prayed that God would take them safely home and, He did. Some He took to their Eternal Home before the next Christmas came. The others had to wait until He took them home to their loved ones. He still takes a few more home between Christmases. He likes their company. The first Christmas I remember in all its many parts and pieces is Christmas, 1945. My Dad had come home, frail and tired, and adapting to a new reality. Perhaps he didn't believe that it was reality, or if it was would last. The tree was huge and shimmered with streams of tinsel, glittered with colourful balls, and hundreds of lights glowed though from behind a cloud of angel hair. The whole house was decorated from top to bottom. It was beautiful. I woke early, while it was still dark, and crept downstairs into the living-room. The only light came from the tree. and it lit up the pile of brightly wrapped parcels beneath it ... and my Dad. He was sitting on the floor beside a large box wrapped in snow white paper and tied with a big red bow. He patted the box and pointed his finger at me then at the box. I went over and together we opened the box. It was a train, an electric train ... the one he had always wanted to give me those four Christmases past. To him it marked the ending of a horrible chapter in his life and to both of us it signaled a brand new beginning. The Dad I had not quite forgotten, nor quite remembered was home. At last. More than 60 years have gone by between the first Christmas in captivity and the one just passed. I'm sure that as each one has approached the veterans of the Battle of Hong Kong have had to deal with the demons of memory that nobody, except those who were there, can understand. Still, as troubled a time as it may be for them, I hope the joy of the moment beats back the dark shadows of the past and that happiness prevails. May all the Christmases to come be better than any of those in the past.